Hello guys... long-time browser, first-time poster. I've used this forum to help me build 2 traditional mortar-bed showers over the past decade, and been very happy with the results. My latest project involves a curbless shower where I need to minimize the height of the shower floor, so I'll probably be using Kerdi. I'm a homeowner, and trying to minimize the cost of the project. My question has to do with the shower walls. On my other projects, I have found visqueen and backerboard to provide satisfactory performance. Is there a problem combining these traditional walls with the Kerdi floor? Clearly you'd have to overlap the visqueen with the Kerdi, just like with a traditional PVC pan. I'm not worried about warranty issues, just performance and cost. I estimate that to use Kerdi on the walls will cost an additional $150. I don't know a way to combine the systems as you describe. While I appreciate the desire to save money, this is one time its well worth it. If you'll enter that geographic location into your User Profile it'll remain permanently in view to help in answering some types of questions. There is really no effective way to do what you're proposing. The Kerdi is a direct bonded waterproofing membrane, meaning you bond the membrane to the backing surfaces and then bond your tiles directly to the membrane. If you were to drape a polyethylene moisture barrier over the membrane you could not do that. If you have a situation requiring you not use a traditional shower pan, do as Paul is suggesting and just build a direct bonded waterproofing shower. 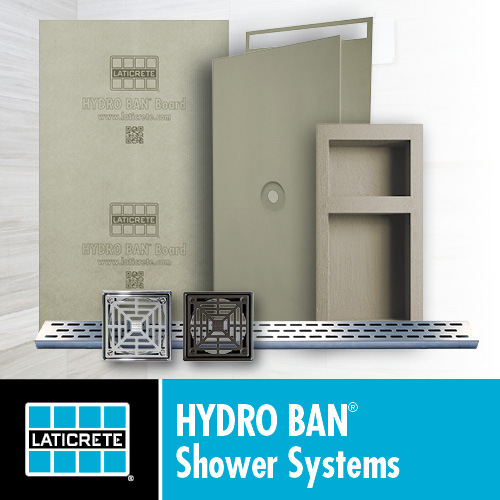 How do you plan to lower your existing shower floor sufficiently to build your curbless design? Here's a diagram of what I was thinking. Still not sure why it wouldn't work. I like the idea of Kerdi to make a thin, dry floor. However, I have never had a problem with the shower walls retaining moisture, and so it seems unnecessary to use expensive Kerdi when visqueen would do. As for the curbless floor, this shower will be installed on an old sleeping porch, which already has a gently sloping floor. I guess this was to shed rainwater back when the porch was open to the elements. The door will be on the uphill side, so there is no need to lower the floor to achieve slope. Last edited by jgleason; 01-07-2015 at 06:42 PM. Trying to reinvent the wheel often leads to problems...there are a bunch of tested, approved methods to build a shower. What you are trying to do is not one of them. Course, you can do what you want in your own bathroom, but how would it pass a flood test? There's no viable way to seal a joint between the walls and the waterproof floor. Seems to be my new standard answer when people try to reinvent the wheel. The typical liner that extends behind the backerboard is 40mils thick. You want to use Kerdi which is only 8mils. Doesnt seem like a smart idea to me. Plus you lose any manufacturer warranty. Break open the wallet and kerdi the walls properly. You want to use Kerdi which is only 8mils. I believe that's the Magic Kerdi, available only in Alex' area. Kerdi fabric is more than twice that thick, but his point is still valid. The Kerdi membrane is designed to be bonded to the backing material. Can you do what you have in mind? Your house, your shower, yeah, I suppose you could give it a try if you wanna. I wouldn't. Thanks for the tips. I appreciate the helpful feedback. This forum really helped me with my other showers, too. As I mentioned, I'm thinking of putting a linear drain to the back of the shower. Is the Kerdi-Line the best linear drain for a Kerdi floor, or can you combine a Kerdi-Drain with a third-party product? Is the Kerdi-Line a reliable product? Specifically, the bonding between the stainless and the fabric would seem like a weak point. Hmmm..... Am I missing something? I always believed Kerdi to be 8mil, and Kerdi band 4mil.... Are you thinking Kerdi-DS? I havent seen the thicker one around here yet, havent had much need for it either. Regular has been working fine for a decade. KERDI is 8-mil thick and has a water vapor permeance of 0.90 perms, when tested according to ASTM E96, using Procedure E at 90% relative humidity. KERDI-DS is 20-mil thick and features additives to produce a water vapor permeance of 0.18 perms. Dunno, Alex. Never seen Kerdi DS that I know of, but I've measured regular Kerdi at 16 to 19 thousandths of an inch thick. Using a regular ol' micrometer when I was comparing it with different membranes. I think Schluter may be talking only about the actual film part of the membrane (although it's not technically a film, I don't think) and not the actual membrane you get off the roll. Never have quite figgered out just how that works, but I do know what I put on my shower walls runs closest to 19 mils. But we don't need to argue that here, eh? Your point is still well taken. I thought the DS was for commercial steam showers.... ? It would qualify for that application where regular Kerdi won't, Paul. I would trust Schluter's ability to bond the fleece to the drain. Now, can you use another's linear drain with Kerdi? Yes, but you may need to use some KerdiFix to make the seal between the membrane and the drain body. The Kerdi line drain comes in lots of sizes, and is sold as two separate order numbers - the drain body, and the grate. If you like the look, the tile-in drain cover is the least expensive option since it doesn't need to be polished and deburred carefully - the others also take a lot more work and care in packing and shipping to keep them from being damaged in shipping. I mentioned that the subfloor already has an adequate slope for drainage, because my shower is going to be constructed on a converted porch. The only purpose of the mortar bed in my situation is to provide a rigid backing and adhesion for the Kerdi. Again, the subfloor is already sloped. 1. What is the minimum thickness for the mortar bed? 2. Could I use cement backerboard screwed to the subfloor instead of building a mortar bed? Is the subflooring planks or plywood?